Here, you need to get a pair of jacks to win the game. Of course, it's called Jacks or Better, because if you get an ace pair, or say a king or queen pair, then it's 'better' than the jacks, and you win too. The card deck is of 52 cards. You play with the 52 cards, same as the previous case, but here we have an extra 'wild' card, usually called the Joker Cad, and you can substitute this card for any card. Basically, you can use the wild card to create many winning combinations, and you can get the winning hand. You need at least a three of a kind to win at this game, and the wild cards are nothing but all the two's in the deck of 52 cards which is usually played with. 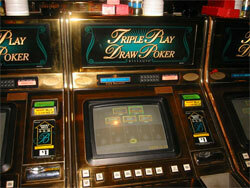 The additional feature here is that you get to chance to play a progressive jackpot. You win this jackpot only if you get the 5 Club Cards. No matter what, the best thing that you can do is bet the maximum allowed number of coins. The reason behind this is that if you get a Royal Flush and you have bet the maximum coins, that your payout will be comparatively quite higher than the case where you haven't bet the maximum coins. You must be thinking that this strategy can end up consuming your bankroll, and turn out to be very expensive-if you feel so, then you can try out the machines which ask for smaller denominations. Try your best that you don't play at machines where you see two or more deck of cards is being used. Usually, these machines don't offer much, so it's best to choose machines where only one card is in use. Sometimes you will find players and some experts that suggest you some particular machines, and claim that your chances of winning are much higher at these machines than the other machines. Usually, you can try believing them, but if you find out it's not working-then stay back. Don't get carried away even if it's a friend whom you deeply trust, since it won't be a practical thing to keep playing at some machine which is "known" and "famous" for high payouts.